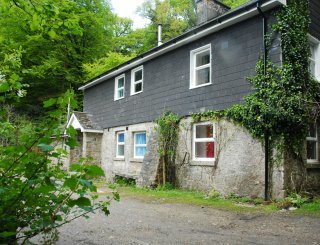 Exmoor Hostel, Dulverton, Somerset, Exmoor, sleeps 15-36 in 5 bedrooms. The Hostel is available for groups of 15 to 36 people, and is always let on an exclusive basis. Situated within the Exmoor National Park and with Wimbleball Lake and the rivers Barle and Exe nearby, Exmoor Hostel is ideally located for canoeists, rowers, budding sailors. cyclists, walkers, and pony-trekkers. Family groups often like to explore the moor, and the North Somerset / Devon coast, just 40 minutes away. Tarr Steps, The Exmoor Pony Centre, and the West Somerset Railway are some of our visitors favourites. 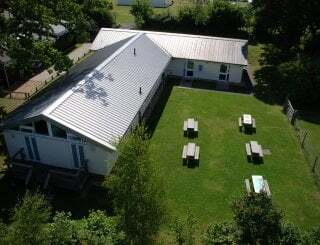 The Hostel is also great for schools for Duke of Edinburgh training and often used by cub, brownie, guide and scout groups. The Centre has full central heating throughout. We provide heating in the winter months, morning and evening. Outside of these times heating is by negotiation. Sleeping accommodation is in five rooms: three large bunk rooms, one smaller bunk room, and one attic room for four. There are two lounges, one leading onto the back garden with barbecue facilities. The recently refurbished basement has non-slip flooring comprising a well-equipped commercial kitchen, and an adjacent dining area that seats 36. At the top of the house, the large roof room is useful for recreational purposes. There are separate showers and wash rooms for males and females and limited facilities for guests with disabilities. Most visitors are self-catering. The commercial kitchen is suitable for large group catering. There is a commercial refrigerator and a commercial freezer. There is a range of eating places in Dulverton to suit all budgets from excellent fish and chips to cafés, traditional pubs and fine dining. There is a full range of shops too. If you require catering during your stay talk to the Hostel Manager about the options available. Well equipped commercial kitchen: 2 turbo fan ovens, 3 induction hobs, 2 microwaves, water boiler, gastronorms, pans, dishes, and kitchen cutlery. Adjacent to the kitchen. Drinks area with water boiler; crockery and glasses cupboards; large serving table; seats 36. 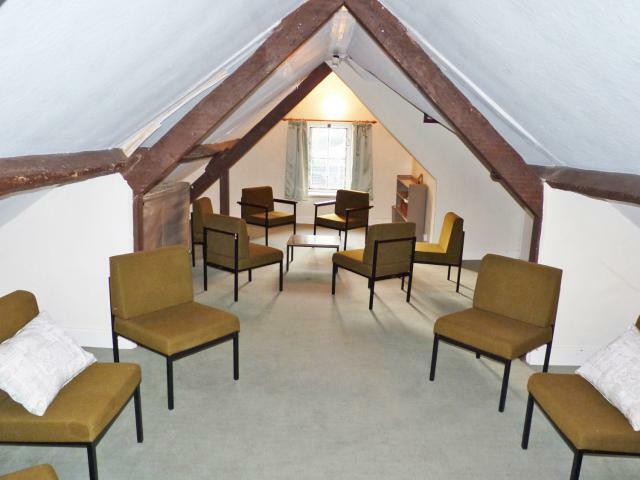 Two large reception rooms boast comfy chairs, sofas, information, books and games. Garden access is via the larger room. Free WIFI. There is a BT payphone. Mobile reception varies according to the network. The Hostel is centrally heated throughout but it is not usual to heat the premises in the summertime. Additional heating is negotiable. Sleeping accommodation is in five rooms: four bunk rooms (12, 8, 8, 4), and a room with 4 single beds. One blanket and pillow provided per bed. Please bring own pillowcase (50p to hire), towels, T towels, sleeping bag. Bed linen £7.50 per set to hire. The Hostel provides separate cubicle showers and wash rooms for males and females. One toilet is equipped for guests with disabilities. Disabled access to one toilet, showers and lounges but stairs restrict access to sleeping areas. A bed can be put up in the smaller lounge. There is a small garden at the back of the Hostel. The swing park is a 5 minute walk away. The sports field is a 7 minute walk away. The property fronts onto a small private car park with a private back garden and patio which includes a BBQ and garden furniture. The public swimming baths are in Tiverton, half an hour away. There is one space available on site for parking. Nearby car parks and some street parking available. No smoking is permitted within the Hostel. 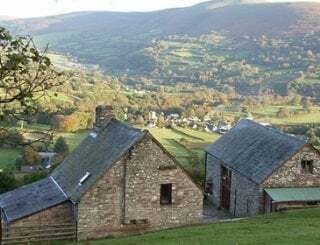 The Hostel is located within the small town of Dulverton, the gateway to Exmoor. A 35 minute drive from J27 of the M5. Dulverton is a small town with a unique high street providing essential shops and interesting eateries. Within a three minute walk. There are a number of good eating places: Thai, traditional, and take-away. The Lion Hotel has a back room that can cater for groups of around 20 people. Nightly rate: Juniors (pre-school, school age) £13.00; Seniors £16. Non-residential fee of £1 per person per day. W/e 16.00 hrs Fri - 12 Noon Sunday (there is some flexibility here). Non-refundable deposit 25% of booking fee confirms booking. Balance due 6 weeks before arrival. Tiverton Parkway 17 miles away. No public transport to the Hostel. 25B to Taunton. 198 to Tiverton. 399 to Minehead. No buses on Sunday. Exeter airport 35 miles. Bristol airport 75 miles. Local coach firms will pick up at airport on request.